PHNOM PENH, Cambodia, Mar 17 2016 (IPS) - The persisting humanitarian crisis of the Rohingya minority in Myanmar has been a global concern after two bouts of organised mass violence against them in 2012. While the Rohingya persecution has been going on for nearly four decades, Myanmar’s reforms launched in 2011 facilitated the international media’s coverage of the mass violence. Myanmar’s treatment of the Rohingya is an unmistakable breach of international human rights laws. Successive Burmese military governments have since early 1970s viewed the Rohingya Muslim minority, who live on their ancestral borderlands between the Islamic country of Bangladesh and Buddhist Myanmar, as “a threat to Myanmar’s national security and local Buddhist culture”. In addition, with the consent and cooperation of the Rohingya community leaders who preferred not to be ruled by the anti-Rohingya Rakhine from the local state capital of Sittwe, Myanmar’s ministry of defence organised a separate administrative district named Mayu – named after the region’s river Mayu – made up of 2 predominantly Rohingya towns and a web of villages. The new administration was placed the direct command of the War Office, then in Rangoon. My own late great-uncle, then Major Ant Kywe, was deputy commander of this Mayu administration. This pro-Rohingya stance shifted when the military leadership purged pragmatic elements from the inner circle within a few years of the military coup in 1962. Progressively, the country’s strong-man, General Ne Win, turned anti-Muslim, xenophobic and erratic to the point where the locals throughout Myanmar would know that the military dictator was in town when they did not hear any amplified calls – 5 times a day – to Muslim prayers: the military banned any Muslim prayer calls from loudspeakers fitted atop mosques as Ne Win found them disturbing his peace! With Ne Win’s tilt towards anti-Muslim racism, Myanmar no longer accepted the Rohingya as historically bi-cultural, pre-state people of the Western Myanmar borderlands region. Additionally, it was feeling threatened by the emergence of a new populous Muslim nation of Bangladesh in 1973 out of Pakistan’s 9-months-long civil war. As a result, Myanmar’s successive military governments have singled out the Rohingya as a ‘threat to national security’, framed them as merely “British-era farm coolies” who were pulled to British Burma’s thriving industrial agriculture. Accordingly, the country’s military, the backbone of all governments since 1962, has pursued varied and evolving strategies to reduce, remove, replace, relocate and otherwise destroy the Rohingya. The state’s strategies range from framing the Rohingya as ‘British colonial era farm coolies’ from the present day Bangladesh who came to British Burma only after the 1820s to painting the impoverished and oppressed Rohingya as potential Islamists intent on importing terrorism from the Middle East. From formulating and spreading the view of the Rohingya as aliens to enacting a national citizenship law to strip the Rohingya of their right of belonging – citizenship – to Myanmar. Myanmar’s official denial and popular rejection of the Rohingya as one of the country’s indigenous peoples collapses under the weight of historical and official documentation. Pioneering historical studies by G.H. Luce and Than Tun as well as ethno-linguistic studies carried out by some British East India Company staff dating back to the 1780’s firmly establish the integral presence of the Rohingya as a distinctly Muslim population of the then Arakan kingdom. International journalists, genocide scholars, human rights researchers and humanitarian aid workers have all acknowledged Myanmar’s persecution of these Muslim minority people. 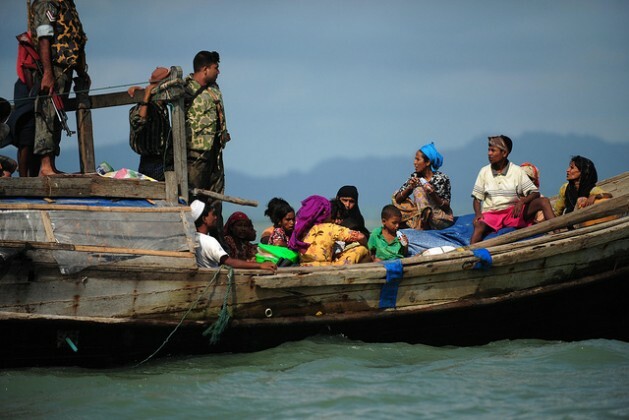 In the last several years, a growing international consensus is emerging as to the nature of the crime: Human Rights Watch has described the persecution of the Rohingya as ‘ethnic cleansing’ while several major empirical studies published by the University of Washington Law School, Yale University Law Clinic, Queen Mary University of London International State Crime Initiative and Al Jazeera English Investigative Unit have accused Myanmar’s military government of commissioning the crime of genocide and other crimes against humanity. Both Myanmar military leaders and the democratic leader Aung San Suu Kyi have publicly refused to heed these calls while dismissing any accusation of Myanmar committing an international state crime against the Rohingya as “baseless” or “exaggerations”. The predominantly Buddhist public in Myanmar is overwhelmingly anti-Rohingya, thanks to the decades of sustained state propaganda against this minority; Myanmar’s ugly religious bigotry echo the frighteningly Nazi-like attitude and views towards this persecuted Muslim minority while the country’s Citizenship Act of 1982 resembles Nuremberg Laws which de-Germanize the Jews and stripped them of citizenship rights and protection. Whether one names Myanmar’s anti-Rohingya policies and practices ‘crimes against humanity’ or ‘genocide’ depends on the level of one’s pragmatism. But what is clear is Myanmar’s humanitarian crisis as experienced by the Rohingya is not an internal affair of a sovereign member state of the UN. Nor is it the outcome of the sectarian Buddhist-Muslim conflict rooted in historical grievances and animosities and unleashed by the country’s democratisation process. It is in fact an act of international atrocity crime committed by Myanmar, a UN member state. As such, only the discourse of punitive action and international non-military intervention has the real potential to bring an end to this humanitarian crisis.